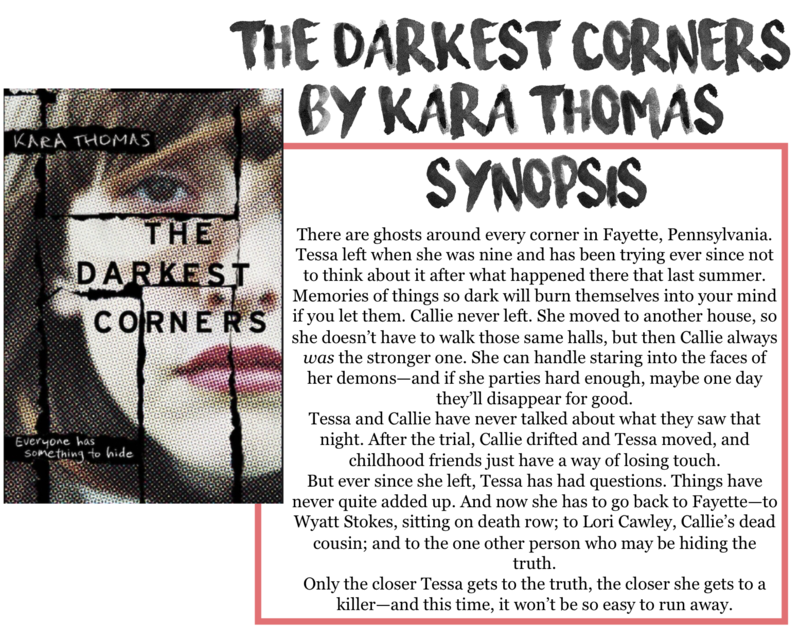 I am back with another book review, today it is The Darkest Corners by Kara Thomas! Thanks so much to Penguin Random House for sending me an eARC for an honest review. All opinions are my own. Basically, this is the story of Tessa and Callie, and the murder they witnessed ten years ago. The alleged murderer proven guilty with the help of a testimony by two 8 year old girls, after Callie's cousin was strangled to death and laid out by the river, like the other 3 victims of the towns local serial killer, dubbed the Ohio River Monster. But a lot has changed in the ten years. Tessa moved away with her grandmother after her sister ran off and her mother wanted them to live out of her car. Callie stayed in the town, forever haunted by her aunt's grief and her mother's pressure to lock up anyone, even an innocent man. After Tessa comes back to town to visit her father in prison, another girl turns up dead, just the way the ORM used to do it. But he's locked in prison for life, isn't he? I haven't read a book this good in a very, very long time. I have been searching for the perfect thriller for a while, and I think I may have found it. Maybe reading this at night helped, but I was on the verge of wanting to keep reading, and being terrified. In the end, I couldn't stop. At the beginning, I didn't know who was behind everything. And neither do the girls. They have some leads, but any one of them seems possible. I liked that. I liked how it wasn't just one person that didn't quite fit nicely into the picture. There were many. And you can see that through Tessa's thought process. I really don't want to say much else about the story, because there are so many twists that are so amazing when you experience first hand. I will say, in those last 80 pages, I wasn't sure I was going to make it. One thing snowballed into another, and it just kept getting more and more insane. And then, that final paragraph, because my heart wasn't ripped out and torn to shreds already, that final paragraph just lit it on fire. I cannot recommend this book enough, and I will definitely be picking myself up a copy!